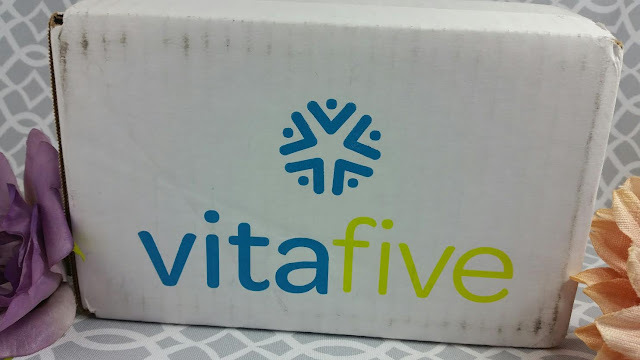 Vitafive Makes Getting Your Daily Vitamins A Breeze! Get 30% Off your First Order. I have to admit that Vitafive might be my favorite way to get my vitamins ever. It's the easiest, tastiest and most efficient way I've ever encountered. 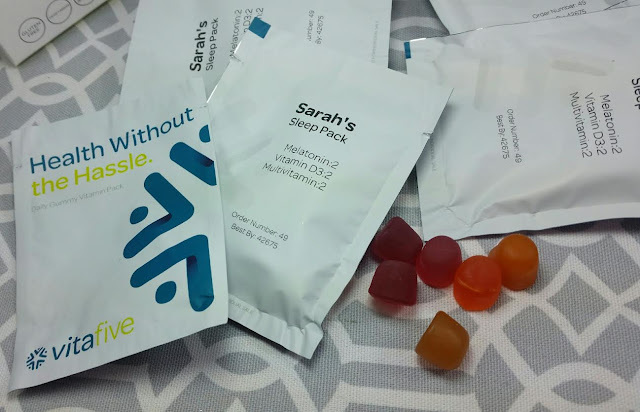 Vitafive sends gummy vitamins by subscription every month. You'll always have what you need and they come in assorted, delicious flavors. There's a lot of benefit to me in a subscription like this. I hate swallowing pills. I hate the smell of multivitamins in pill form and I hate forcing myself to get one down, chugging copious amounts of water to get rid of the taste in my mouth. So I just didn't take them. Until I found out kid vitamins could be gummy! I thought that would solve all my problems. Nope. I discovered I'm also lazy. When my bottle runs out, it takes me ages to actually buy another one. Vitafive, on the other hand. automatically sends you your new box so you are never out of vitamins. It doesn't matter if I'm lazy-- they show up anyway! What You Get: Individual, personalized gummy vitamin packs in great flavors sent directly to you every 4 weeks. 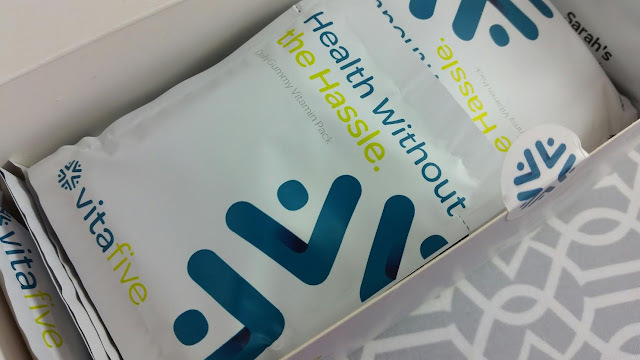 Each month you'll be sent 30 packets of vitamins of either your choice or a preset mix. Since my husband tends to have issues sleeping I got the Sleep Pack to share with him as a test. 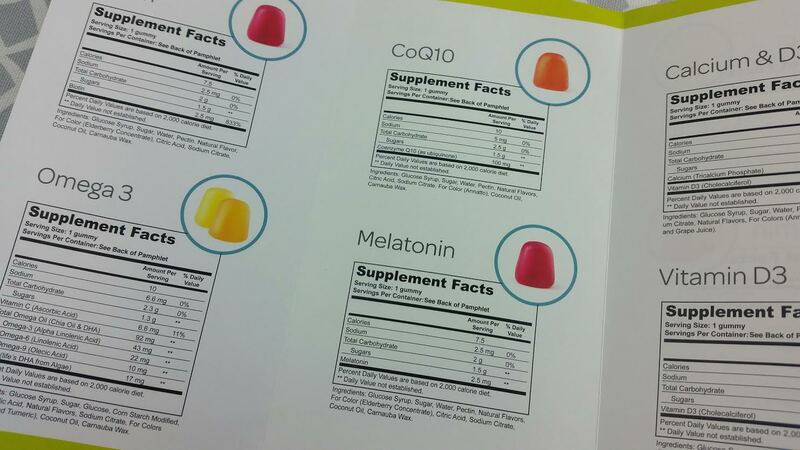 Inside our Sleep Pack are 2 Melatonin, 2 Vitamin D3, and 2 Multivitamin. Many factors, such as changes in hormones or vitamin deficiencies, affect your body’s ability to achieve quality sleep. Melatoin and Vitamin D3 directly regulate sleep and our Multivitamin supports body restoration as you sleep. 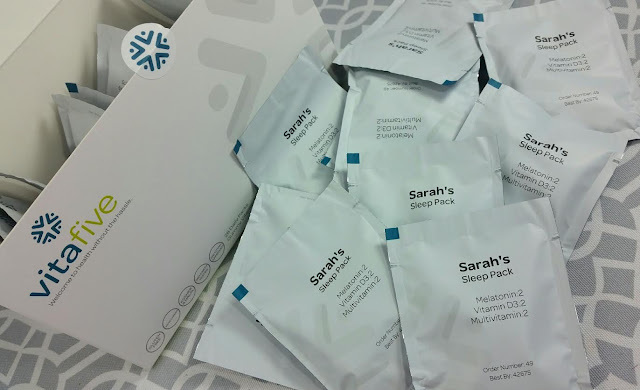 If you are experiencing trouble falling asleep, staying asleep or suffer from fatigue during the day, the Sleep Pack is for you! There are seven different mixes: Sleep, Beauty, Immune, Heart, Essential, Active and Brain. Each package has a different combination of vitamins or you can create your own. They even have packs for kids! Just throw a pack in their lunch and you're golden. Trust me, they'll eat them. Here is what's in the Multivitamin: Vitamin A, C, D, E, B-6, B-12, Folic Acid, Pantothenic acid, Iodine and Zinc. The quanitites listed are for 1 gummy but as an adult you will take two. The perfect amount will arrive in your pack and you just take them all once a day. Guess what? Not only are these vitamins good for you but they're also produced in California using 99% of vitamins sourced from America! They're free of Milk, Eggs, Fish, Crustacean Shellfish, Tree Nuts, Peanuts, Wheat, Soy, too. They're vegetarian (some are even vegan) and are gluten-free. 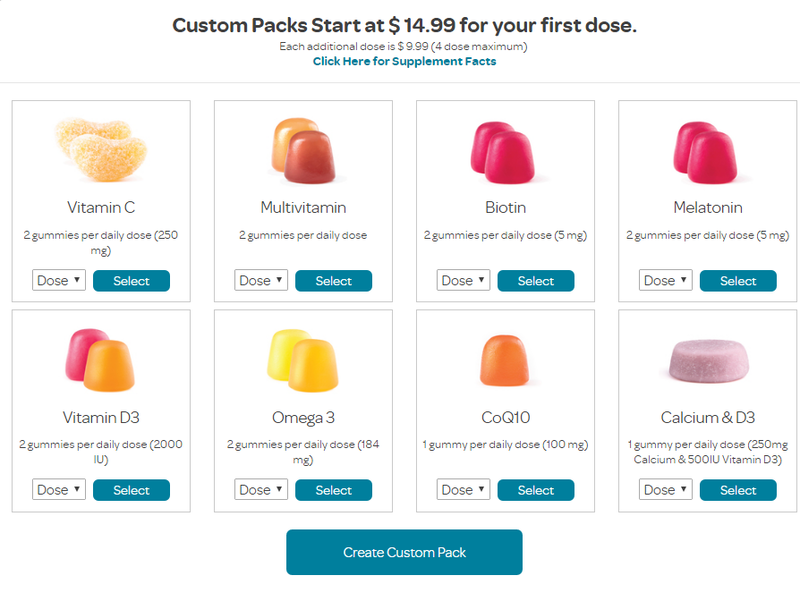 Since the combination of vitamins you would like the most may not be one of the preset packs, you can create your own custom pack. These are all the vitamins offered. You can choose up to 4 doses. Each dose is two gummies. Normally each pack comes with up to three different vitamins but if you customize your pack, you can add an extra one. Prices range from $29.99 for a preset pack or set of 3 customized doses to $44.96 if you get a four dose customized pack. They will arrive as a box of individual packets with your name on them! Ordering for more than one person? Each person's packets will have their name on it so there is NO mixing them up! I can't even tell you how awesome having indivudually packed daily vitamins is. I went on a camping trip recently and I brought these with me. One packet for each day. It was SO easy to grab one, take them and move on. It's one of the things I love so much about this. There is no way I would normally take my vitamins with me. No one is going to bring giant bottles when space is at a premium. But a few small packets wedged into a bag? Easy peasy. Remember, I got the Sleep Pack. I took one every night before bed and slept like a rock. Normally I tend to fiddle around in my brain, especially in a tent with all the noise the forest makes at night. Nope. Now, that could be because I walked fifty thousand miles and was completely exhausted but I can't discount my Melatonin vitamins! I don't think I've ever taken vitamins with me anywhere before. You can stuff these in a lunch sack, bookbag or briefcase for yourself, your spouse or your kids. It's that easy. I told my mom about it because she's been vitamin crazy for a few years now (she wants to protect her bones) and she loved the idea of being able to take a stash to work, leave them there and have one packet each day. What's also nice about a Vitafive subscription is you can switch up your pack any time from your account. Getting an Immune pack for over the winter but want to switch to the Active pack for the summer? Do it! I think I'm going to switch to the Beauty pack for fun (and to see if that Sleep pack is packing the punch I think it is when it comes to falling asleep). VERDICT: Obviously I'm slightly enamoured of this subscription. I'm getting up there in age and I want to make sure I'm getting the nutrients I need. While my diet probably provides most of what I need, I'd like to supplement that. It's so easy, customer service is great and I'm finally taking my vitamins again! Of all my subscriptions, this might be the most useful and impactful. If you would like to sign up for Vitafive, you can do that here! Get 30% off your first order with code BITBOX30! Am I the only one who cannot swallow those horse sized, stinky multivitamin pills?! 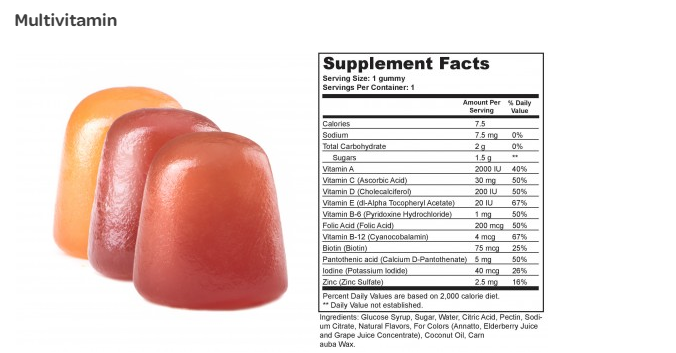 Gummy vitamins for the win! *This box was sent complimentary for review purposes. All opinions are mine. Seriously. I love this.